On July 25, Alex Schwartz found himself in a very different setting than his usual Fifth Avenue office. 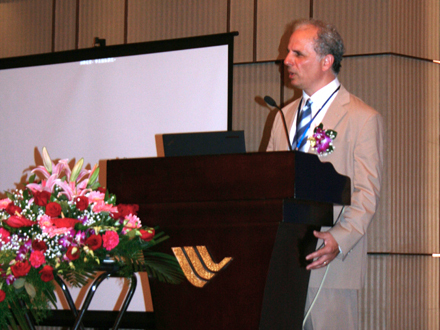 The associate professor in Urban Policy Analysis and Management at the Milano School of International Affairs, Management, and Urban Policy was standing in front of 300 academics and government officials—in Shenzhen, China no less—about to give the keynote presentation at a day-long international conference on housing policy. However, the urban policy and community development expert is used to being called upon to impart his knowledge on the subject matter—for quotes in the New York Times, as a guest lecturer across the U.S., and more. Organized by the Shenzhen Real Estate Center, the Hang Lung Center for Real Estate, Tsinghua University, and the Center for Real Estate and Urban Economic Studies, University of Connecticut, the conference explored the many challenges the Chinese face in their own housing sector. “The Chinese are very interested in learning how the United States and other countries have addressed their housing issues,” said Schwartz. Having spent much of his academic career researching urban planning, as well as publishing a book entitled Housing Policy in the United States, Schwartz was up to the task of enlightening his Chinese counterparts. “Apparently, they liked my book,” he said. Schwartz’s presentation, “From Crisis to Austerity: Social Housing in the Obama Years,” was based on a recent article he had published in Housing Finance International, which examines trends and challenges for affordable housing in the U.S. He discusses how the housing market collapse in 2008, which helped trigger the worst financial crisis and recession since the 1930s, wreaked havoc on the homeownership sector—causing several million households to lose their homes to foreclosure and putting 20% of all homeowners with mortgages “underwater” with negative home equity. He also looked at how the crisis damaged the rental sector, especially affordable rental housing for low- and moderate-income families. To see more of Alex Schwartz’s recent publications and research contributions, visit his faculty bio page.